Natural disasters and weather emergencies are in the news. Whether it’s the devastating wildfires along the West Coast, the relentless rains and flooding along the East Coast, or tornado strikes in the Midwest, it’s heartbreaking to see people lose their homes and businesses. But it’s despicable when scammers exploit such tragedies to appeal to your sense of generosity. — This article originally was published on the Federal Trade Commission’s Consumer Information blog. Colleen Tressler is a consumer education specialist with the FTC. 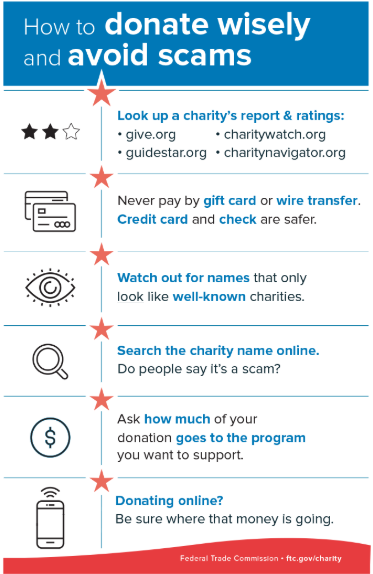 If you’re looking for a way to help, the Federal Trade Commission urges you to be cautious of potential charity scams. Do some research to ensure that your donation will go to a reputable organization that will use the money as promised. Designate the disaster so you can ensure your funds are going to disaster relief, rather than a general fund that the charity could use for any of its work. If you get donation requests by email, never click on links or open attachments in e-mails unless you know who sent it. You could unknowingly install malware on your computer. To learn more, go to ftc.gov/charity. For tips to help you prepare for, deal with, and recover from a natural disaster or severe weather event, visit Dealing with Weather Emergencies. Natural disasters and weather emergencies are in the news. Whether it’s the volcanic eruptions in Hawaii and Guatemala or the wildfires in Colorado, it’s heartbreaking to see people lose their homes and businesses to the ongoing devastation.